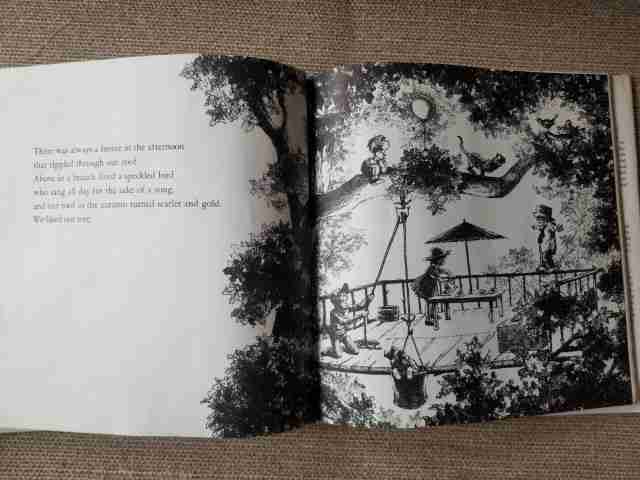 I love the lyrical text, the detailed illustrations, and the vocabulary. I suspect she loves the repetition and the idea of living in all the places that the children move to. You might want to check your local library for this book, since the book is out of print. You might be able to find used copies on Amazon or eBay, but the availability varies. There is a more recent edition of this book available, but I recommend the older edition because of the lovely, detailed illustrations. 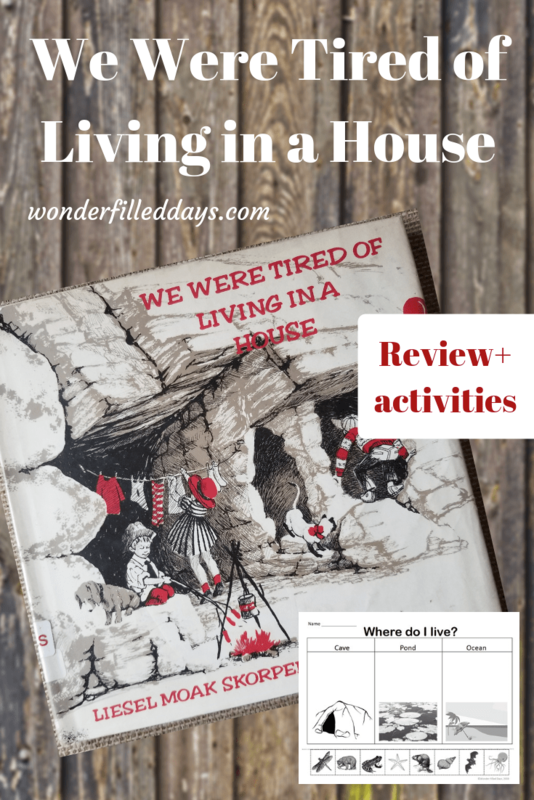 I think you and your child will enjoy reading We Were Tired of Living in a House together. If you want to expand some of the concepts in the book further here are some ideas. Read books that have to do with pulleys. Try How do You Lift a Lion? and Pull, Lift, and Lower: a Book about Pulleys to get you started. There are a lot of fun leaf art activities you could do. Discuss the colors crimson and gold while working on these activities. If leaves are available, you could do this autumn leaf painting. Here is an art activity with finger paint if you don’t have access to leaves. Or you could try this Autumn Hand Print Art. 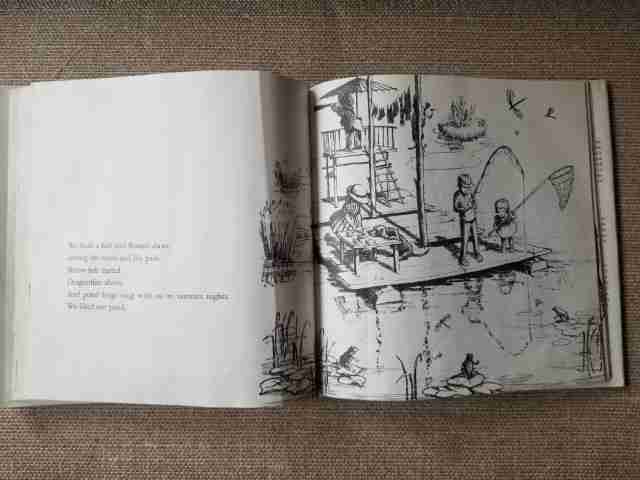 Point out some of the words in the book your child might not know and discuss their meaning. What are some of your favorite vintage children’s books? Thank you for reminding me about this book! 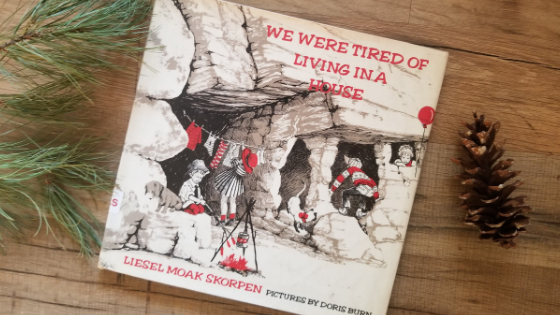 I loved reading “We Were Tired of Living in a House” as a child. Now I need to find a copy for my children! We keep checking it out at our library. It’s probably time to buy my own copy!